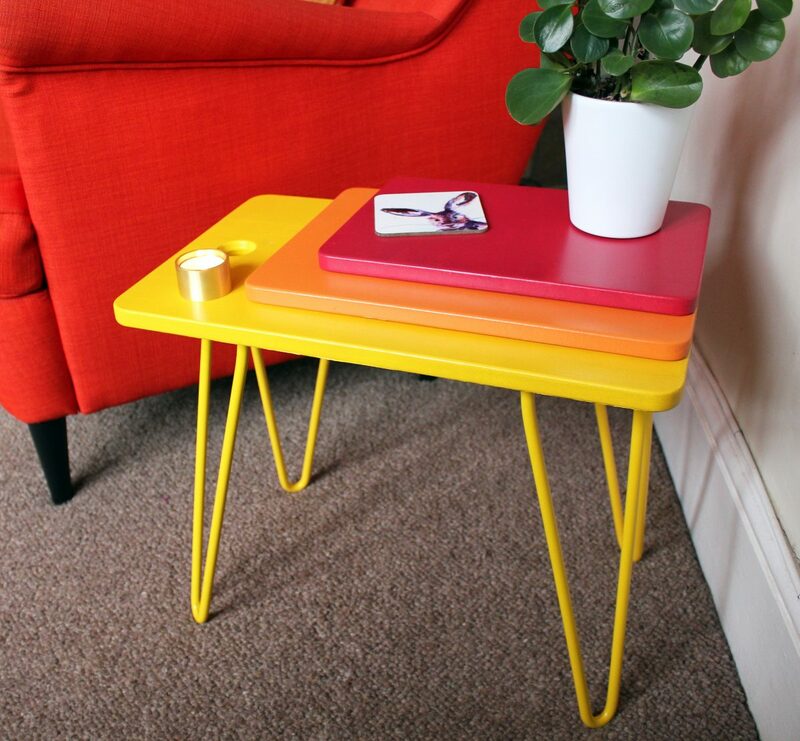 Voilà, le side table – only took a year! What do you do when your chopping boards are a bit grim and need replacing? You make a side table, naturally. It all started with a vision. A vision to create something beautiful and avoid going to the recycling station. I was envisioning a win-win scenario whereby I could let flow my creative juices, make something out of, let face it, junk and save the environment by not throwing perfectly good wooden IKEA chopping boards away. Forward a year and a bit later, and voilà, there we have it. This project is by no means a year’s worth long endeavour. It simply tumbled out of sight, out of mind to a faraway corner all wrapped up in plastic for later. Eventually, later becomes now, so I decided to finish it this weekend to finally employ it in all its glory before we temporarily put it to rest when travelling later this year. My vision started with me wanting a pink side table. Not millennial pink, in case you’re wondering. No, a deep raspberry pink. Don’t ask about the legs, the legs were never the focus point when I closed my eyes dreaming of said pink table. In fact, I only decided on the colour of them last week, mostly forced by the limited available colours for short hairpin legs. After looking at various places for THE pink, I realised it wouldn’t be quite so possible. [Insert fading of pink table dream clouds into nothingness here] It was a friend who saved the day and suggested the rainbow colour palette (thanks friend). I like giving new life to stuff that doesn’t serve a purpose anymore. I also like not spending a lot of money on it and seeing what I can pull together. I found sample packs of paint in a DIY store in the south of France. Don’t ask why these things don’t exist here (at least not in my vicinity) where you can get little tester packs of all sorts of colours. They cost €2 a pack and considering I wasn’t going to paint a dining table or a wall, a few of each colour were all I needed. Also, nice challenge getting these things through airport security as part of your toiletry bag. Now that I am sitting next to it writing this post, I wish I had finished it way earlier. I love it and highly recommend doing something like this. Just don’t take a year like I did. Hallo Isa, ein wunderschöner Beistelltisch ! Wow that looks great! Good idea and very nicely done!